Distributed By – Music Matters Ltd. Recorded on May 19, 1965. Sticker says Acoustech Mastering, Kevin Gray and Steve Hoffman but runouts show just Kevin Gray at Cohearent Audio (Hoffman did sign the ones he helped master). Everything that drummer Pete La Roca did before making Basra was a prelude in his career, and all of his later accomplishments are anti-climatic in comparison with this album. 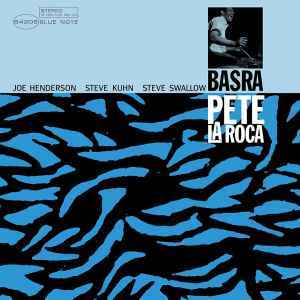 In 1965 La Roca, a respected but somewhat obscure drummer gathered together an unbelievable quartet comprised of Joe Henderson, pianist Steve Kuhn and bassist Steve Swallow for the Basra album. This was the only time that this group ever played together yet they sound very much like a major band that had been performing this music for years. Henderson is in astounding form, inspiring the other musicians to create famous versions of "Lazy Afternoon," "Eiderdown" and "Malaguena," renditions that are not only memorable but became the definitive way to play these songs. La Roca contributed three colorful originals that deserved to become standards while his very stimulating drumming helped to bring out the very best in the players. But it is Joe Henderson who lifts Basra into the cosmos, making the album magical and one of the must-hear recordings of the mid-1960s. Label is blue and white, with "45 Stereo Long Playing" "Blue Note Records Inc • New York USA". Back cover reads "43 West 61st St., New York 23". Remastered to perfection, quality pressing at 45RPM, nice thick gatefold cover, one of my all time favorite jazz albums from 60`s, i`m happy.